Are you or your business looking for contemporary acrylic printing? Acrylic printing is a fantastic way to show off stunning prints without a frame and adds an extra dimension to your images. 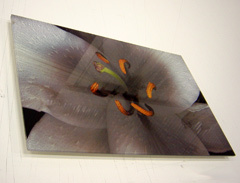 Images look outstanding in our high quality acrylic sheets. If you are looking for an innovative way to show off your artwork or photographs, choose modern acrylic printing from Superchrome, the nation’s favourite large format printing and exhibition suppliers. We print from your digital images, photographs, artwork, negatives and more. Acrylic looks great outdoors, indoors and is the latest design statement for interior design or the home and office. A choice of self-adhesive optically clear acrylic film or acrylic sheeting is yours with Superchrome acrylic printing. Superchrome print directly onto acrylic or onto optically clear acrylic film using the best in HP inks to create superb visual effects. If you are looking for outdoor signage, ask us to print directly onto acrylic as this will ensure your businesses outdoor signage or outdoor exhibition displays are durable and resistant to all weathers. Self-adhesive film can be mounted between sheets of acrylic, with ready to hang mounting points and brackets. Choose from transparent, clear, coloured or satin acrylic for your high-resolution acrylic printing. Choose from a range of thicknesses including 3mm, 5mm or 10mm. We offer a selection of sizes including A1, A0 and even 2m x 3m. Contact our sales team for further information about acrylic sheet sizes. We often create fantastic displays tailored to individual customer’s needs for trade shows and exhibitions. Whatever you are looking for, Superchrome is here to help. All you need to do is email your photographs and we will print them directly onto acrylic. Yes, it is as easy to order as that! Our prices are low and we offer excellent customer services. If you need acrylic printing in a hurry, come to Superchrome as we print fast. Are you ready to order a beautiful acrylic printing from Superchrome or would you prefer to speak to one of our graphic design team or customer services? Superchrome is always happy to help with your order.